Links on story titles are available to be read for free (or downloaded for free), via the links. David Rorshach’s Dream Comes True (short story, science fiction), For The Oceans (benefit anthology), Sonar4, Nov 2011. Reprint. Out of print. Creation’s Flaw (short story, steampunk). Penny Dread Tales: Volume Two: A Phantasmagorical Calliope of Clockwork and Steam (anthology), Runewright, March 2012. 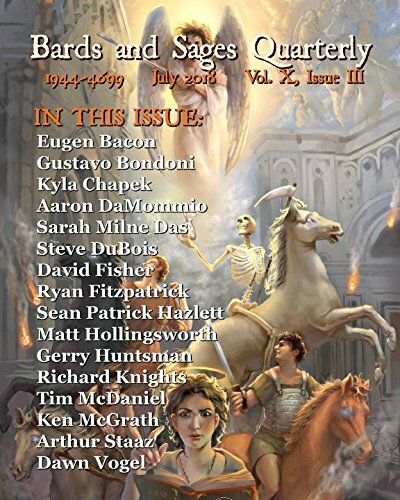 Dom and Gio’s Barber Shop (short story, Mythos Horror), The Lovecraft eZine Issue 21, 22 Jan 2013 (Podcast [issue #21] also available). Nov 2014 – available in Lovecraft eZine’s 2013 Megapack. Hills (flash fiction, horror/humour). AntipodeanSF (online and radio/podcast), Issue 185 November 2013. The Wooden Tomb (children’s horror). Frostfire Worlds Issue 2 (1 Nov 2013). Pretty Kitty (short story, horror/ghost story), Contrary Cats anthology, Indigo Mosaic, Dec 2013. Crazy Mike McCloud (short story, weird western), Railroad! Celebration Station, ed Tonia Brown, March 2014. Guardian of the Sky Realms (novel, young teen fantasy – Cohesion Press, November 2014 (out of print). Of The Color Turmeric, Climbing on Fingertips (short story, horror), Night Terrors III anthology, Blood Bound Books, Dec 2014. Roland’s Merry Christmas (flash fiction, horror), Australian Horror Writers Association, 2016. Journey to the Depths (flash fiction, maritime ghost story), Anemone Enemy anthology, Oscillate WIldly Press, July 2017. The Oak Tree’s Shade (poem, horror), HWA Horror Poetry Showcase Volume IV (ed. David E. Cowan), HWA, September 2017. How the Mighty Fall (horror flash piece), Trickster’s Treats #1 anthology (ed Steve Dillon), October 2017. The Place Where Two Eagles Meet (short story, alt-hist/steampunk/dark fantasy), CEA Greatest Anthology Written, Celenic Earth Publications, October 2017. Guardian of the Sky Realms (middle grade fantasy novel), Meerkat Press, Jan 2020. Unnamed sequel to Guardian of the Sky Realms (middle grade fantasy novel), Meerkat Press, 2022.